Roman archaeology is one that is dominated by regional and thematic studies; there is no up-to-date, comprehensive textbook that focuses on the archaeology of the Roman world. There are, however, a number of surveys, handbooks, and companions that you might find useful as introductions to this history of Roman archaeology as well as the questions that Roman archaeology aims to answer. The following are just a few options that you may find useful on a number of topics that come up often in Roman archaeology - there are many places to start! Alcock, Susan E. and Robin Osborne (eds). 2008. Classical Archaeology. 2nd ed. (2012). ​Malden, MA: Wiley Blackwell. Part of the Blackwell Studies in Global Archaeology series, this edited volume gives accessible overviews by top scholars in the field of Roman archaeology of the state of Roman (and Greek, by the way) archaeology according to various themes: the countryside, cult and ritual, households, identity, etc. Roger B. Ulrich, Caroline K. Quenemoen (eds). 2014. A Companion to Roman Architecture. Blackwell companions to the ancient world. Literature and culture. Malden, MA: Wiley Blackwell. better/more illustrations. Check out the Yale architecture handbook series by Ward-Perkins (1992), Roman Imperial Architecture. Oleson, John Peter. 2008. Oxford handbook of engineering and technology in the Classical world. Oxford University Press. Laurence, Ray. 1999. Roads of Roman Italy: Mobility and Cultural Change. New York: Routledge. Cleary, Simon Esmonde. 2013. The Roman West: An Archaeological Study, AD 200-500. ​Cambridge University Press. Mitford, Timothy Bruce. 2016. East of Asia Minor: Rome's Hidden Frontier. Oxford University Press. Clearly I haven't seen this yet, but the AWMC praises its excellent maps. Talbert, Richard J. A. (ed). 2000. Barrington Atlas of the Greek and Roman World. Princeton University Press. Peña, J. Theodore. 2007. Roman pottery in the archaeological record. Cambridge: Cambridge University Press. For pottery, it's also worth your while to check out also anything by John W. Hayes: e.g., Handbook of Mediterranean Roman Pottery (1997). Yegül, Fikret. 2010. Bathing in the Roman world. New York: Cambridge University Press. Alcock, Susan E. 1993. Graecia Capta: The Landscapes of Roman Greece. ​Cambridge University Press. Ramage, Nancy H. and Andrew Ramage (2013 ). Roman Art: Romulus to Constantine. 6th ed. Kleiner, Fred. 2010. A History of Roman Art: Enhanced Edition. Wadsworth. Elsner, Jaś. Imperial Rome and Christian triumph : the art of the Roman Empire AD 100-450. Oxford University Press. This journal has themed issues that sometimes cover Roman archaeological topics, where scholars respond to an article on topics like "Understanding objects in motion: an archaeological dialogue on Romanization" (June 2014), "Frontiers of the Roman Empire" (June 2008), or "Communities and the Empire. The power of contextual analysis" (June 2005 - lots about Roman coinage). The discussions are lively, informative, and innovative. Check out also interest groups via the AIA (e.g., Roman Provincial Archaeology Interest Group). LacusCurtius (University of Chicago). In particular, his ​Gazetteer of the Roman World walks through (mostly Roman) sites with photos and descriptions. He provides useful explanatory photos and references to the sites (and the events that took place there) in ancient literature. Stanford Digital Forma Urbis Romae Project (Stanford University). This collaboration between computer scientists and archaeologists aims to "solve the map" - or Severan marble plan - of Rome. In the meanwhile, it provides a good resource for exploring the imperial city not just in terms of locating major monuments but in wider urban, commercial, and residential contexts. ​Ancient World Mapping Center (University of North Carolina at Chapel Hill). This research center was the force behind the Barrington Atlas of the Greek and RomanWorld (2000), which is also an incredibly useful resource! The AMWC continues to produce maps (many of which are available as free downloads) and to refine the geographical dataset for the ancient world (many of which are available for download as free .shp files for GIS) in partnership with the Pleiades Project. Pleiades (ISAW, NYU). Pleiades is a useful resource for finding and visualizing material and sites: you can key in search terms to limit the map to sites that have baths, for example, and then filter out those sites that have been tagged as having baths. 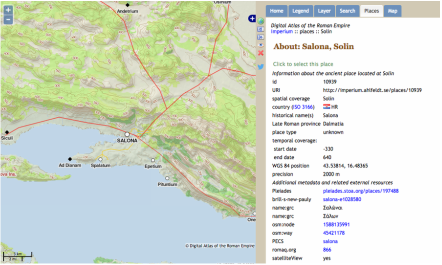 You can click on the site names to find location (and its accuracy), and further information links (e.g., for Salona in Croatia) linked to other databases like the Digital Atlas of the Roman Empire. Digital Atlas of the Roman Empire. You can search for places by their modern or ancient place names, which will turn up information such as the type of monuments recorded at the site. Digital Atlas of Roman and Medieval Civilizations (Harvard). Like the Digital Atlas of the Roman Empire, DARMC allows you to search for place names, but it will also, like Pleiades, allow you to search for certain elements (roads, bridges, etc.). ORBIS. The Stanford Geospatial Network Model of the Roman World (Stanford). The interactive ORBIS model reconstructs the duration and financial cost of travel in antiquity, allowing you to calculate travel times according to origin, destination, season, and type of transportation.